The family of Gilberte Gervais (née Loubier-Fontaine) are heartbroken to announce her death at her residence on November 22, 2018 one month short of her 83rd birthday. Devoted wife of the late Marcel Gervais (May 25, 1991). She leaves behind her children; Ray Gervais, Denis Gervais, Debrah Gervais-Hancock (Doug), Lynn Gervais and Lori Medeiros (Carlos). Fondly remembered by her grandchildren; Melissa Vocal, Christopher Vocal, Tanya Gervais, Domenica Martinello, Shannon Gervais, Tyler Medeiros, and Curtis Medeiros and her great grandchildren; Tyler, Meaghan, Logan and Mackenna. Dear sister of Lise St. Aubin and Marcel Fontaine. Predeceased by her parents Adolphe and Marie-Louise (née Laliberté) Loubier, her brothers Ben Fontaine, Larry Fontaine, Tony Fontaine and her sisters Monica Molnar and Jeanne Lejeune. Gilberte managed the Atlas Hotel for 20 plus years. 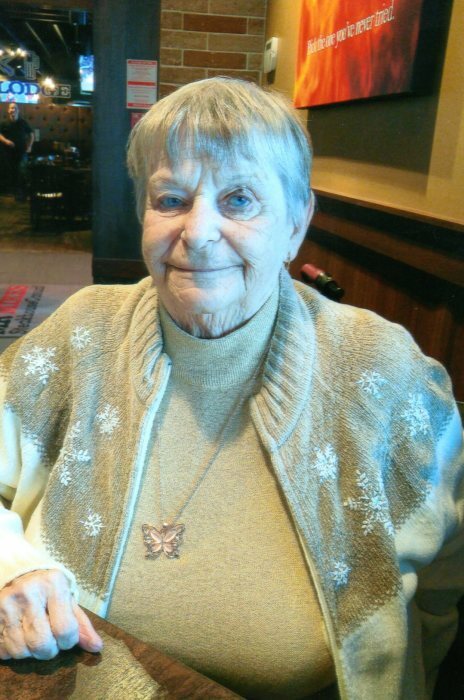 Mom was a caring and giving woman with many friends who she enjoyed spending time with. In her quiet times, she'd spend many hours completing jigsaw, Suduko and crossword puzzles. She cherished her butterfly jigsaw puzzle she completed and proudly displayed it in her living room. The family will gather at the WELLAND FUNERAL HOME 827 East Main Street, Welland to receive their relatives and friends on Tuesday, November 27 2-4 p.m. & 6-8 p.m.and Wednesday, November 28, 2018 2-4 p.m. & 6-8 p.m. Funeral service will be held on Thursday, November 29, 2018 at 12 p.m. in the funeral home chapel. Interment will follow in Holy Cross Cemetery. As an expression of sympathy, donations to the Niagara Health - Walker Family Cancer Centre would be appreciated by the family. We would like to express our deepest thanks and appreciation to the Walker Family Cancer Centre, March of Dimes and St. Elizabeth Healthcare for all your care, support and mostly the compassion that you showed, not only to our mother, but also to her family. This past year and half was much more bearable because of all of you.